This morning after our weekly homemade pancake breakfast, we gathered our tools and planted next year’s garlic. We did 4 rows this year right among the annual rye that was seeded a month ago or so. The annual rye will be dead come spring, and we’ll till it under for organic manure for the garden. I split some tiny cedar strips which get inserted next to every other planted clove. That way I’ll know what to avoid when I till next spring. 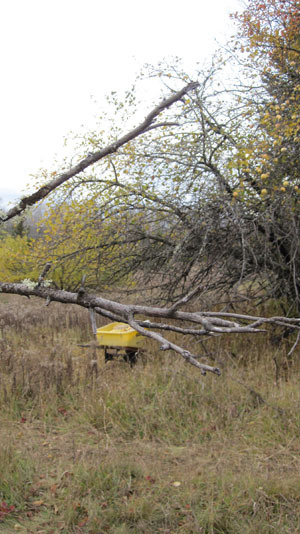 In the afternoon I outfitted the wheelbarrow and headed out on a scouting mission to locate some leftover apples. The season has been over long ago, and it was obvious which trees had apples this year from all the pounded down turf under the trees. There were a half dozen trees with some apples hanging on. I started out using our tree picker, which is a wire cage with fingers on a long pole that I can reach up with and coax the apples into the basket. It is very slow. Towards the end, I just shook the trees and picked up what fell to the ground. I got about a wheelbarrow and a half, which I hope will net us about 6 gallons of cider. I hope to make wine and applejack again this year. I walk by the completed woodpile several times each day. Sometimes I give it a pat, and other times, I take a deep breath with my face right up against the freshly split chunks. It is a fine smell that fills my lungs. This entry was posted on Sunday, October 21st, 2012 at 7:35 pm and is filed under Uncategorized. You can follow any responses to this entry through the RSS 2.0 feed. You can leave a response, or trackback from your own site.